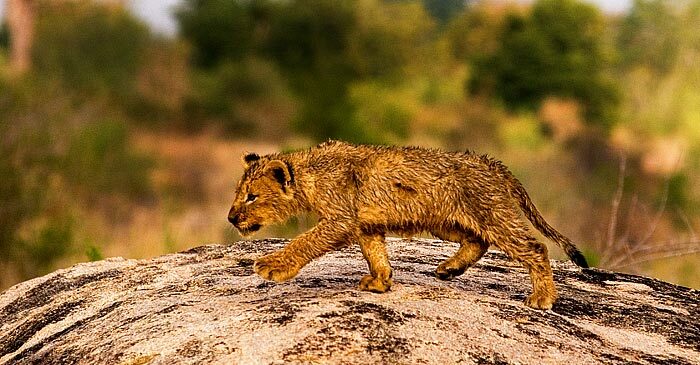 Growing up as a lion cub is a constant learning process. Unlike us these days, learning quickly for them is ultimately a case of life or death. Their constant play is all about learning the skills that enable them to survive once mom is long gone. The other morning we were fortunate enough to witness a long spell of just such play. Before we knew it, however, what seemed like just another regular morning of messing about turned into a significant life lesson. 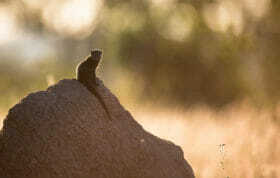 As the pride walked through the Sand River, a group of Banded Mongoose scattered from the reeds. Most were quick enough to get away. 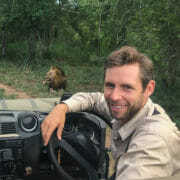 However, one mongoose, injured by one of the lioness and allowed to run free as a practical hunting lesson for the cubs, wasn’t as lucky. 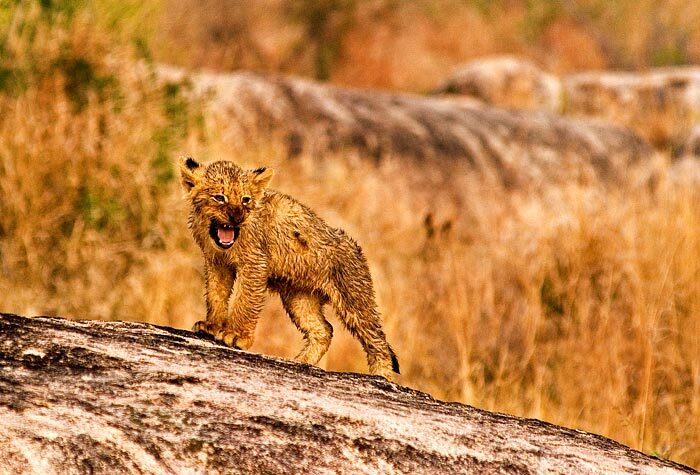 The male of the older group of cubs came straeaking across the granite rocks….securing his first ever kill! 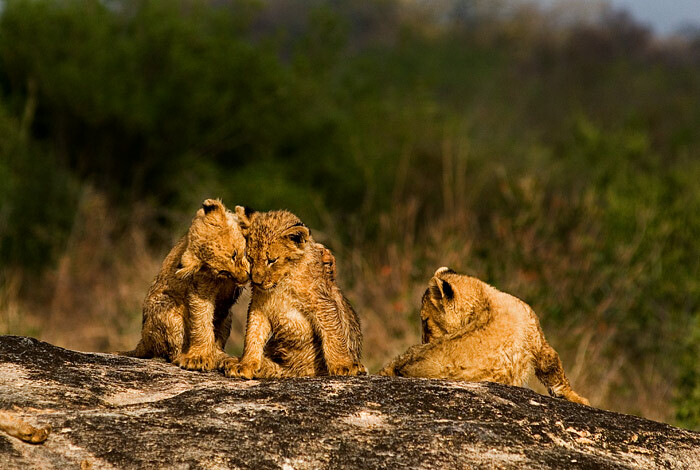 Social bonding amongst lions starts at birth and is important in ensuring a unified pride that not only hunts well together, but also will stick together and defend each other in times of conflict. 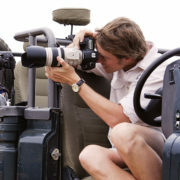 Agility-whether avoiding a brutal swipe of a buffallo's horns or the sharp claws of a rival lion, having the awareness and agility to get out of the way will prove invaluable. 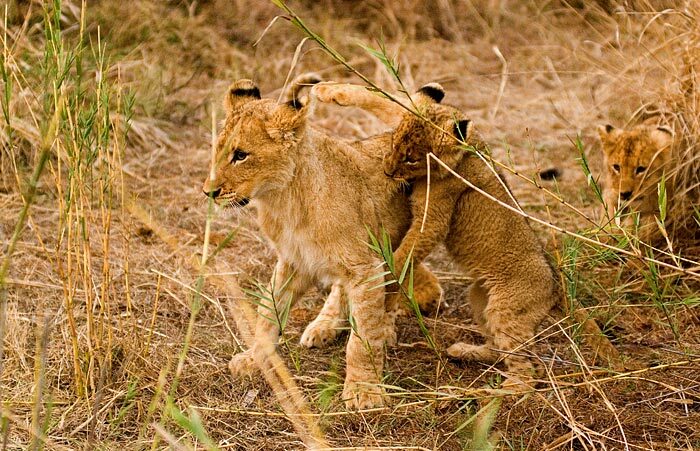 The Trip-another classic hunting move especially useful for bringing down fast, more agile prey, one of the cubs attempts to trip another by swiping at the back leg. 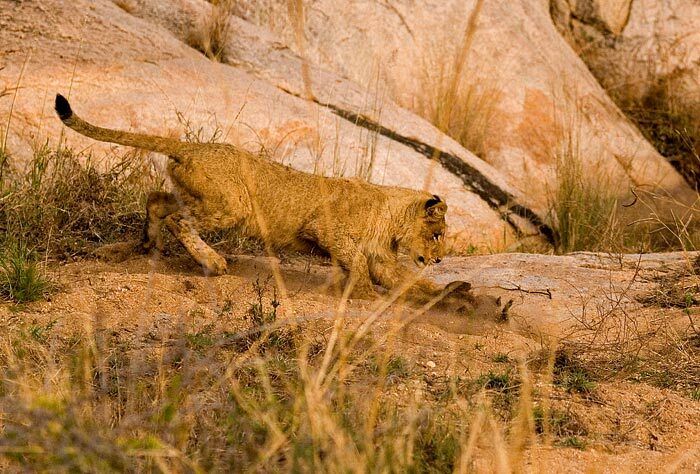 One of the younger Tsalala cubs stalks a sibling. Even at this age they already have a keen sense of the movements required in order to sneak up on prey. Attack! 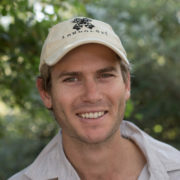 The moment this Tsalala cub grew up! 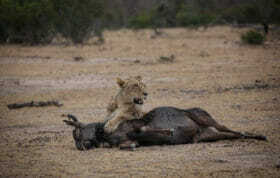 After a short chase the young male pounces on the banded mongoose. 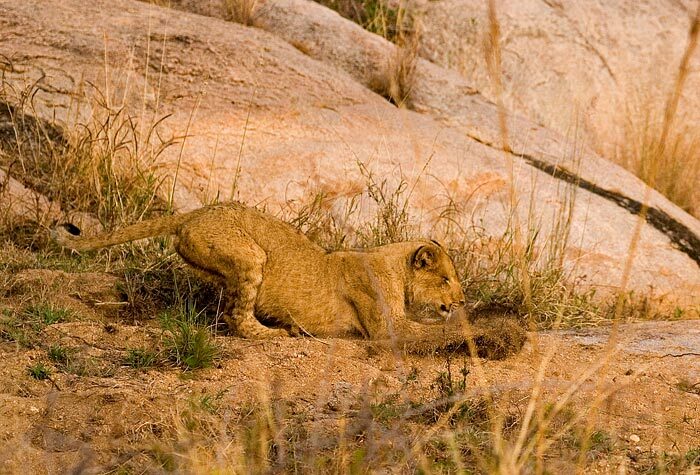 The unfortunate mongoose tries in vain to escape the young lion's already formidable paws. The older cubs are looking more and more like "real" lions these days-and playing the part as well after their first kill. Amazing photos, especially the one with the youngster in mid-air. Just last June they were playing on the rocks together, now they are hunting. Bittersweet but lovely to see, Thank You! Great Pictures they are all growing up so fast! These pics are unreal… awesome Doyle! Hi, Of the older cubs, wasn’t it the male who had the limp? and to make his first kill! 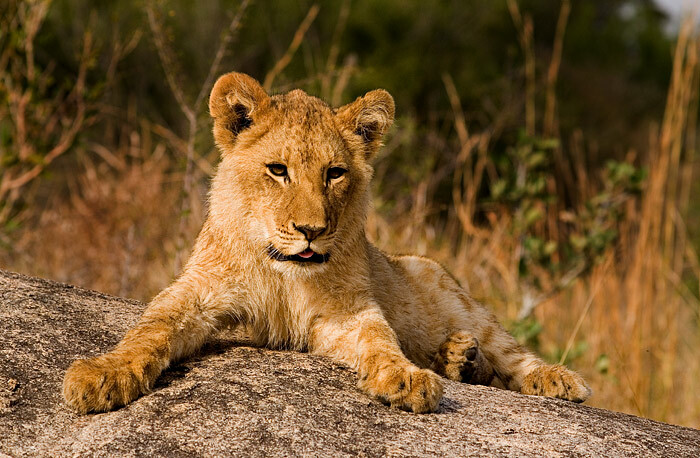 Do you know that the genders are of the younger cubs? 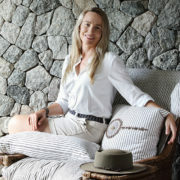 Every day I look forward to your blog! This one especially touching to me! Amazing how photos tell a story – you have captured these young ones so well. Thank you! Spectacular images! 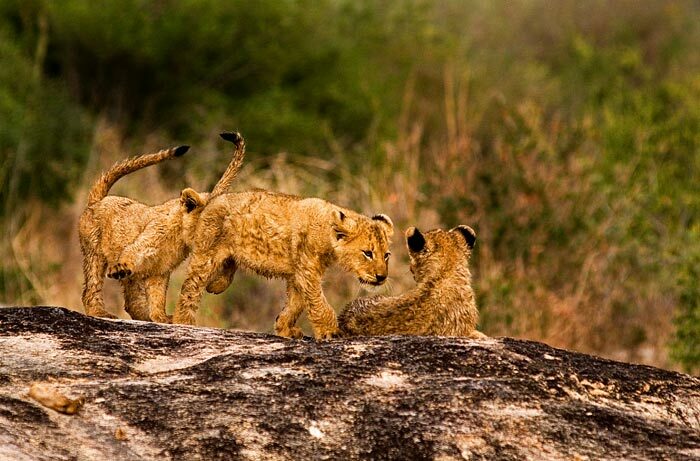 We enjoyed seeing the cubs at Londolozi in mid-July and now look at them… Coming back soon to check on their progress! An unreal series of absolutely beautiful pictures. 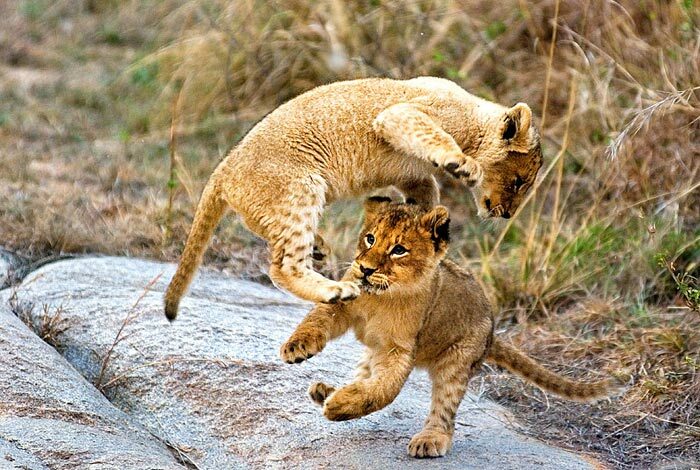 I’m so in love with the agility one, and “attack” where he practises on the older cub. It is so unbelievable that I am able to watch these youngsters really mature… and from such a distance. The Tsalala Pride growing strength by strength.